“The Black Panthers” stand together for a group photo. From left to right – Emma McGrath, Tommy O’Dwyer, Rachel Ryan, Breda Meares, Mark Meares ( CBRE), Michelle Ryan, Michael Murphy (Site Manager), Paul McGrath, Siobhan McGrath – Assoc. Dir, HR Business Partner, MSD, Ballydine. Staff at Momentum Support took part in a fitness event competing against other companies inspired by the television program “Operation Transformation,” similar to the American show “The Biggest Loser.” While the competition was independent of the weight loss television program itself, the goal was the same: to collectively be the fittest, healthiest team still standing. The company’s fitness event started on 4th January 2016 and ended on 7th February 2017. The team members, who called themselves “The Black Panthers,” were Emma McGrath, Tommy O’Dwyer, Rachel Ryan, Breda Meares, Mark Meares (CBRE), Michelle Ryan, Michael Murphy (site manager), Paul McGrath, and Associate Director Siobhan McGrath. After 8 weeks of following a strict daily fitness regimen, “The Black Panthers” won the competition! “The Black Panthers” followed “Operation Transformation” fitness methods, meaning daily weigh-ins and weekly health discussions from dieticians and trainers about nutrition and exercise. The total amount lost was 43 kg and Tommy O’Dwyer lost the most at 1.5 stone. 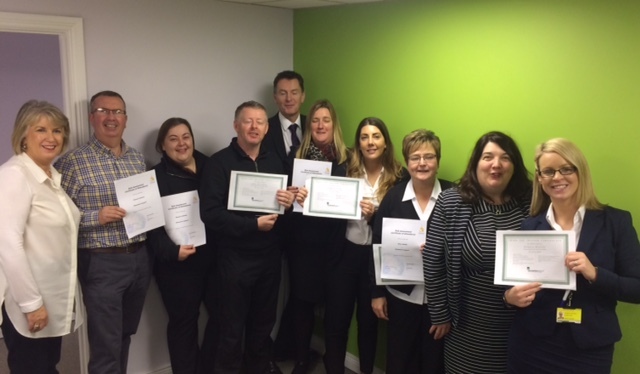 Participants in the Republic of Ireland and UK training sessions celebrating successful training completion. 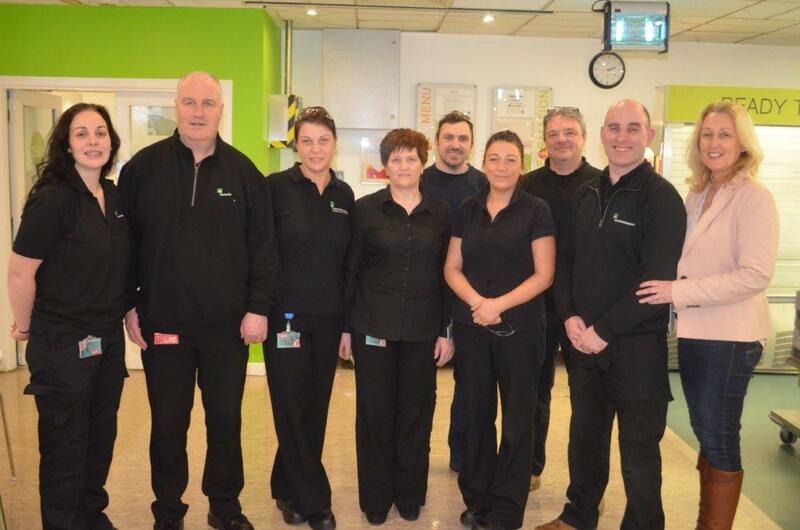 Verona Pentony, Training QSHE Manager of the Momentum Support Group celebrated the successful completion of the conversion in cleaning standards from the British Institute of Cleaning Science COPC to the Cleaning Professionals Skills Suite 2.0 CPSS with different Momentum teams in Dublin, Belfast and London. Many thanks are due to the teams’ and the trainers’ hard work & commitment during the transitional period as they succeeded in training all operatives on sites throughout the company. It was a proud moment as trainers & assessors were presented with the first BIC SC CPSS and assessor cards. Successful candidates were also presented with Certificates in FETAC Level 6 manual handling instruction, Momentum Support “Train the trainer” and risk assessment training. 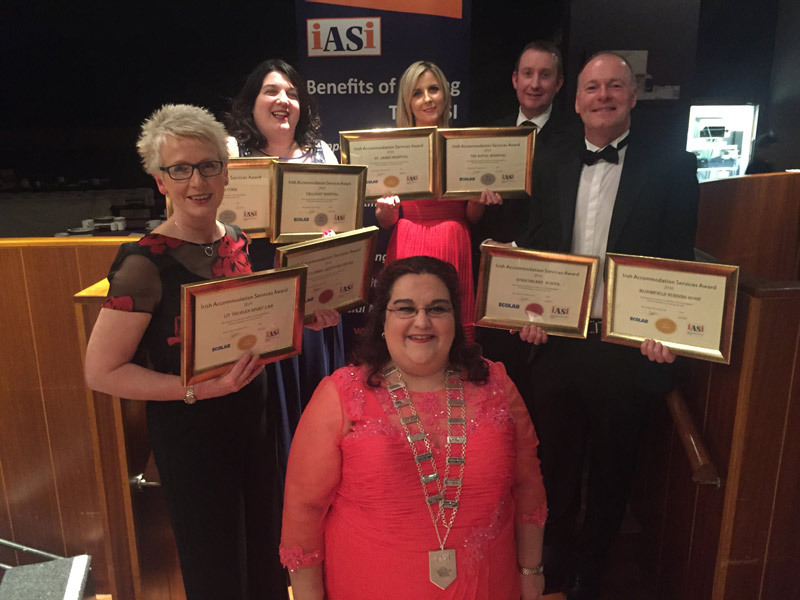 Momentum is once again extremely proud to announce success at the annual Irish Accommodation Services Institute (IASI) Award ceremony. Each entrant is exhaustively and independently assessed and only those that reach the high standards of the awards can win. The IASI was set up in 1985 to promote best practice across the accommodation field. 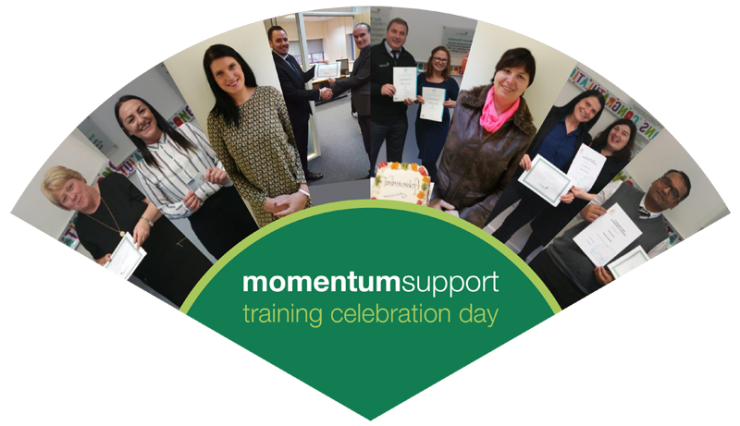 Their annual awards are one of the big calendar events in the Accommodation Industry, and once again all the hard work and dedication of Momentum staff have been recognized at the 2017 awards. A win like this is not only achieved on the day of judging, nor is it achieved by one person. 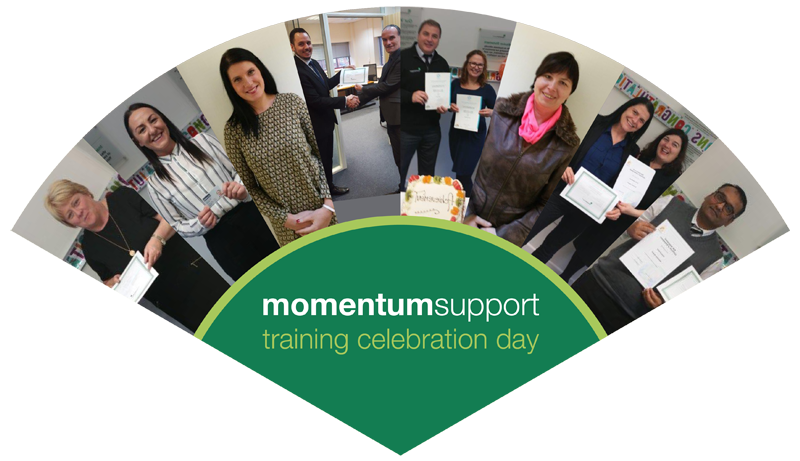 It is thanks to the combined efforts of the Momentum team that we continue to succeed each year at the awards. As Napoleon Hill said “There is one quality which you must possess to win, and that is definiteness of purpose, the knowledge of what one wants, and a burning desire to possess it”. Momentum collected a number of awards in all categories, Gold, Silver and Bronze – and big congratulations to the winning Momentum teams below. Laura Whelan and the Team at Mater Hospital for achieving Gold Standard, including achieving runner up in the Healthcare Supreme award. This is a wonderful achievement and the second time since commencement of the contract on the 1st May 2015. The IASI judge visited all site entries and undertook a complete audit including general condition, appearance of the environment, cleanliness, hand hygiene, waste management and patient equipment. Well done to all those involved. This official recognition is well deserved and is a reflection of the expertise and hard work of all our team. Here’s to another fantastic year ahead. 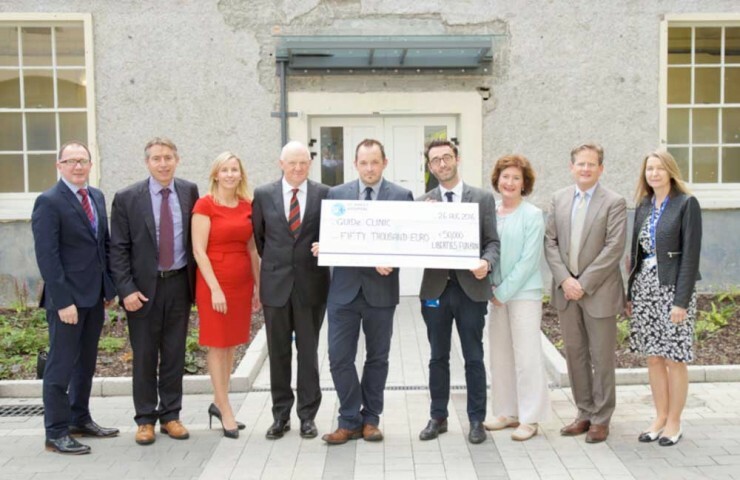 Colin Maybin and Sinead Grogan from Momentum Support presenting cheque for €50,000 to St James’ GUIDe Clinic. Colin Maybin and Sinead Grogan from Momentum Support were in attendance to present a cheque for €50,000 to St James’ GUIDe Clinic. As co-sponsors of the Liberties Fun Run held on 21st July 2016, Momentum support were proud to support the work of the clinic and were delighted at the response to the event. GUIDe Clinic is the largest free treatment centre for HIV & STIs in Ireland. Over 27,000 patients attended the outpatients clinic at the Genital Urinary Medicine and Infectious Diseases outpatients clinics at St. James’s Hospital in 2015. STI and STD infection in Ireland continue to rise and the work carried out by the GUIDe clinic is vital in this battle. Donations can be made at the www.supportstjames.ie website. The Liberties Fun Run was, as always, part of the annual Liberties Festival. The Liberties Festival has been running since 1969 and won the LAMA national community and council awards 2016. A mix of sports events, poetry readings, arts and drama, the festival reflects the history and cultural significance of The Liberties in Dublin City. A visit to the festival quickly shows the visitor the warmth and humor of the locals. Asking any local about this ancient area’s Viking heritage is one way to begin your exploration of the Liberties. Momentum want to wish all the participants and organisers of the 2016 Fun Run and Liberties Festival very well done for all their hard work. Both were a great success and we look forward to seeing you all at the starting line next year! To learn more about the St. James’ Hospital Foundation, the GUIDe Clinic, and future events, please visit www.supportstjames.ie. 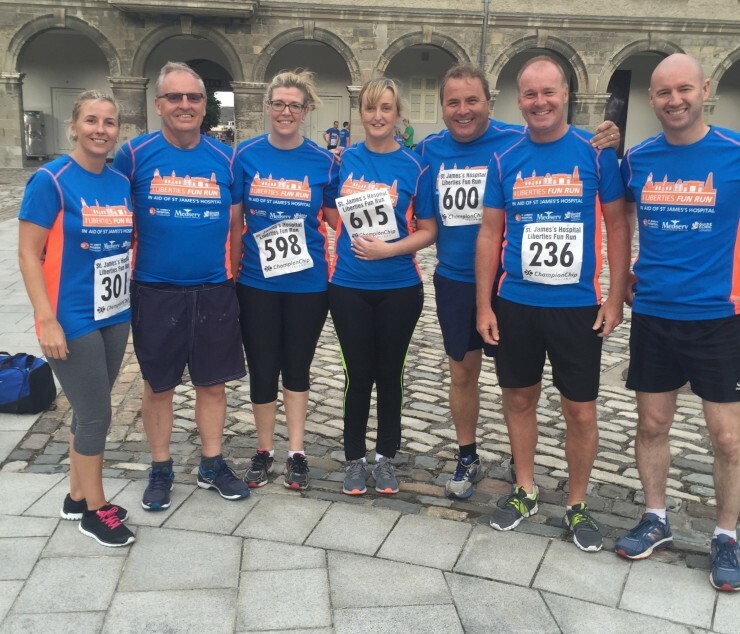 Momentum Support are extremely proud of their employees that took part in the Annual Liberties Fun Run for the GUIDe Clinic and St. James’ Hospital Foundation on the 21st of July. The timed 6 kilometre run through the old city featured 1,000 runners, including seven from the Momentum Support team – Gary Comerford, Con O’Brien, Andrew O’Brien, Paula O’Connor, Sylvia O’Sullivan, Sinead Grogan & David Ferguson. While some had taken part in runs like this previously, it was the first time participating for Gary, Sinead, and Andrew. While there’s no real training involved for a run like this, it is still a big challenge for any non-runner, so it was a great achievement for all the new and previous runners involved. The race was organised to raise funds and promote awareness for the foundation. The run is in its eighth year, and the route had runners starting on the picturesque grounds of the Royal Kilmainham Hospital, and passing through famous parts of the area, including St. James’ Gate, Francis Street, and the Coombe. Proceeds for the run were donated to the GUIDe Clinic at St. James’ Hospital, which was established in 1987, providing the largest free treatment centre for HIV and sexual health in Ireland. On their website, the foundation thanked the 1,000 runners and organisers who gave their time and energy to supporting the wonderful cause. In the picture from left to right, CQ Michael Duffy, Brig General Michael Beary (2BDE GOC), Vice Admiral Mark Mellet (Chief of staff), Dorota Kasperska, Harry O’Farrell, David Gibney, Sergeant Eamonn Woods, Corporal Graham Taylor at the the Kilmainham Gaol Execution Commemorating Ceremonies on the 3rd May 2016. 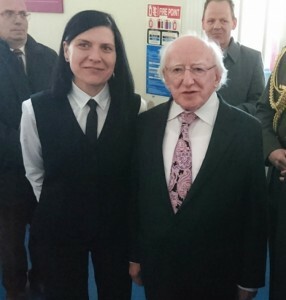 The President of Republic of Ireland and Dorota Kasperska at the ceremony for Opening of Military Archives in Cathal Brugha barracks on the 26th April 2016. Momentum Support were on duty at the opening ceremony for the newly constructed and refurbished home of the Military Archives, on Tuesday the 26th April. The senior most leaders of the Irish Defence Forces were joined in attendance by President Higgins and the First Lady, along with hundreds of guests who gathered at the Cathal Brugha Barracks in Rathmines, and Momentum was on hand to provide first class hospitality. Both before and following the opening ceremonies Momentum Support accommodated the many visitors and dignitaries and the day was a huge success. The archives in Dublin will hold records of the Defence Forces, the Department of Defence and the Army Pensions Board, and is one of the flagship programmes of the 1916 commemorations. Following this came the commemoration ceremonies to mark the centenary of the executions of the leaders of the rising. 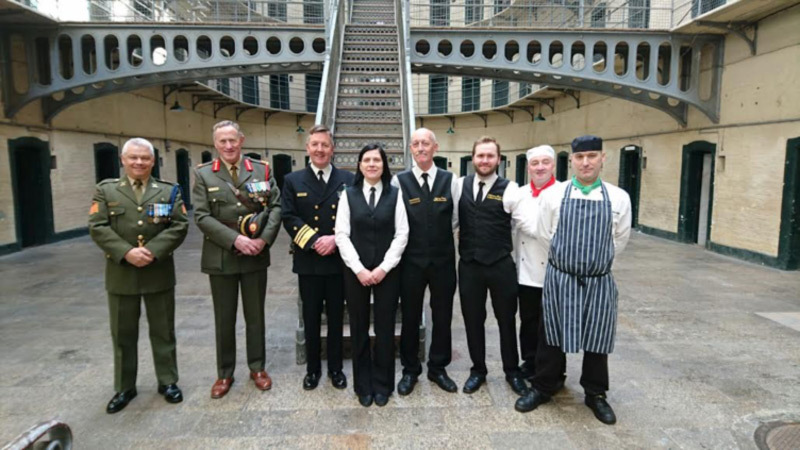 The series of events, held in Kilmainham Gaol, began on the 3rd of May in remembrance of Patrick Pearse, Thomas Clarke and Thomas MacDonagh, the first three of fourteen leaders to be executed. 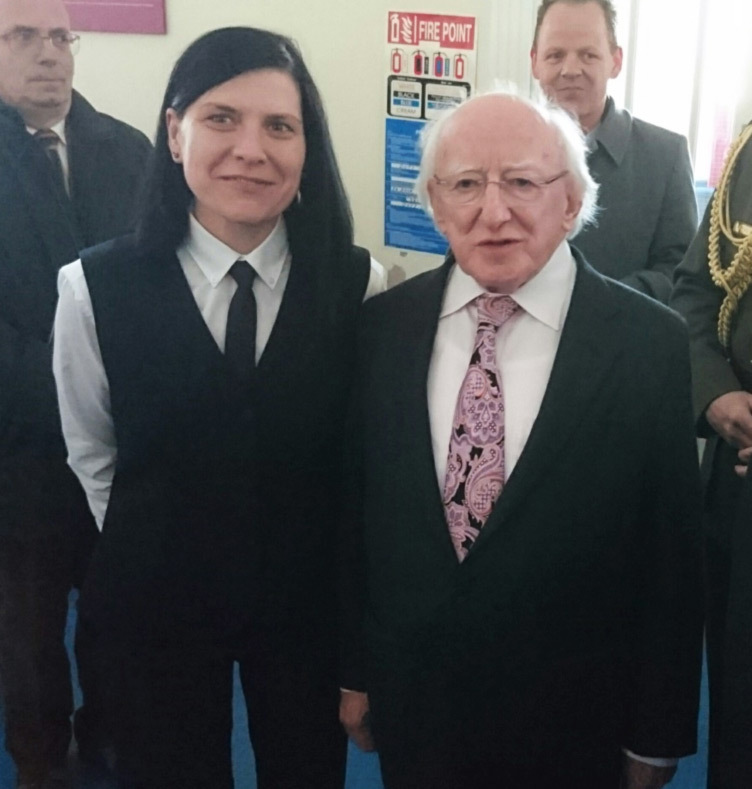 The First lady and Dorota Kasperska at the ceremony for Opening of Military Archives in Cathal Brugha barracks on the 26th April 2016. Momentum provided support and hospitality for the five remembrance ceremonies that took place in the Stonebreakers Yard, concluding on the 12th of May. 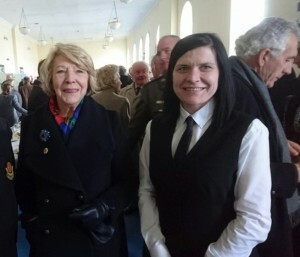 As well as the many hundreds of attendees and global media, also present were Descendants of the revolutionaries, members of Government, Heads of State, Church, The Irish Defence Forces, as well as President and First Lady Higgins. From Left to Right, Brig. 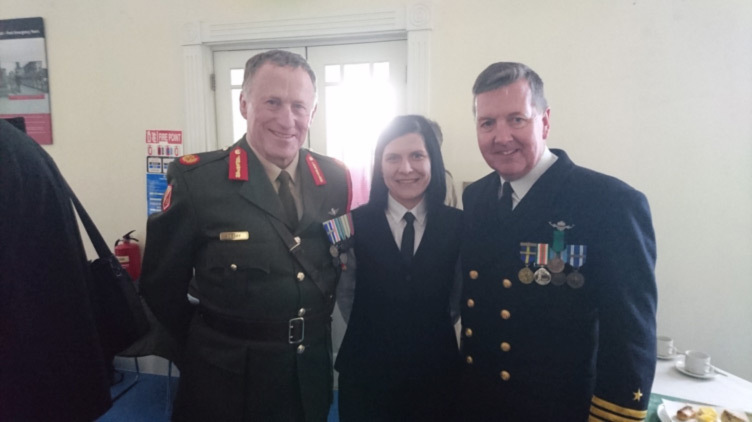 Gen. Michael Beary, Dorota Kasperska, Vice Admiral Mark Mellet during the ceremony for Opening of Military Archives in Cathal Brugha barracks on the 26th April 2016.